Bookshop Talk: SOPHIE'S SQUASH by Pat Zietlow Miller, 2013. SOPHIE'S SQUASH by Pat Zietlow Miller, 2013.
Review by Amy Finnegan - writer, reader, Bookshop Talk host. If you've ever been around a child for a significant amount of time, you've likely seen them get attached to something they just can't carry around forever—a blanket or a stuffed animal for example. And every once in a while, they’ll latch on to something completely illogical (in the opinion of our finite adult brains), like the Halloween pumpkin they carved or colored, or in Sophie’s case, a sweet little squash that’s just the perfect size to cuddle and love. I’ve seen this very thing—squash love—with my own daughters, more than once (it never ends well). If you look at a squash, really look at it, you’ll see that a squash is a perfect, chubby doll that only lacks a face—a problem easily solved with a Sharpie marker. 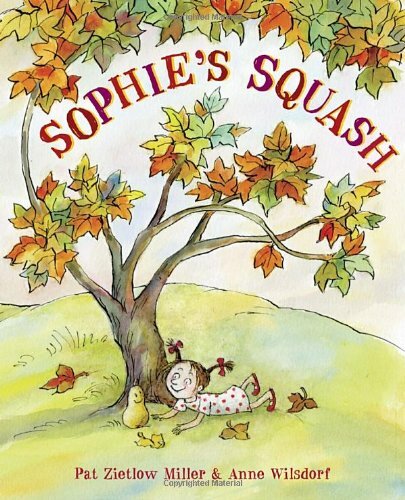 In SOPHIE'S SQUASH, Sophie takes her adorable new friend, Bernice, everywhere she goes. To the library, to do somersaults down the hill, to visit the other squash at the farmer’s market . . . the fun goes on and on. Until, well, you know. Bernice starts to look a little under the weather, and Sophie has to think up a plan to help out her friend. The illustrations are perfect for the tone of the story, and the interpretation of the text is spot on. Sophie’s personality jumps off the page, making you want to take not only her home with you, but her squash as well. Kids will be drawing faces on produce for years to come after reading this . . . and you’ll want them to. I promise, you will love this picture book. It’s one that you’ll definitely want for your home collection. Thanks for this fun review, Amy! Thank you so much for featuring my book!